Domain Lodge is a modern and welcoming motor lodge conveniently located in the central city and is an ideal choice for corporate or leisure, especially those visiting Auckland University, Starship and Auckland Hospitals or the vibrant and trendy restaurant and shopping districts of Parnell and Newmarket. 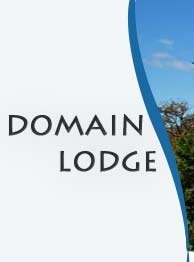 More than a motel, Domain Lodge will feel like your home away from home with the best of Auckland at your doorstep. Its tranquil garden setting is a haven offering security and comfort after a busy day in the city. We are proud of our guest facilities and look forward to welcoming you soon. You are assured of a high standard of friendly service and attention. "Enjoyed my stay and would definitely recommend it and return myself..."
What a wonderful experience - only sorry I had just one night to enjoy the lodge... you have a wonderful team of staff..."
"I was most impressed by the gardens - so peaceful, you wouldn't even know you're in a big city!!" "I've never stayed in such a beautiful relaxing, friendly, charming and calming environment like this..."
"One thing I noticed is the extreme quietness of the room at night..."
"It is a delight to stay here and to be welcomed like old friends..."